briolette | All About Jewelry! As some of us have heard, Kim and Kanye aren’t the only ones attracting attention for their little one’s choice of name this week. Recently, the executive of a Chinese jewelry company announced a similar act of baby naming as she’s attached to her baby, a 75-carat briolette diamond now known as “The Star of China.” As seemingly ridiculous as this may sound, this naming bug has been something that has been a form of inspiration from many varying sources. Tiffany Chen, vice chairwoman of China Star Entertainment Ltd., is the wonderful woman who purchased the 75.36-carat, D color, Type IIA diamond at Christie’s May 28 Magnificent Jewels sale in Hong Kong. As is the tradition with exceptional diamonds, Chen named her stone, selecting “The Star of China” as a nod to her jewelry company. Chen who paid a whopping $148,000 per carat for her Star, set a new sale world record for a briolette diamond at auction and was just one of the latest in a line of record-setting sales. 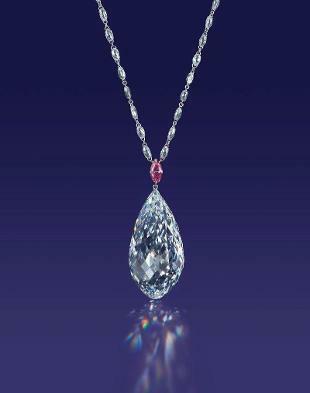 The $39.3 million sale of the Princie diamond at Christie’s New York set a new record for a Golconda diamond at auction while the 101.73-carat pear-shaped Winston Legacy raised the bar for colorless diamonds at auction when it sold for $26.7 million.